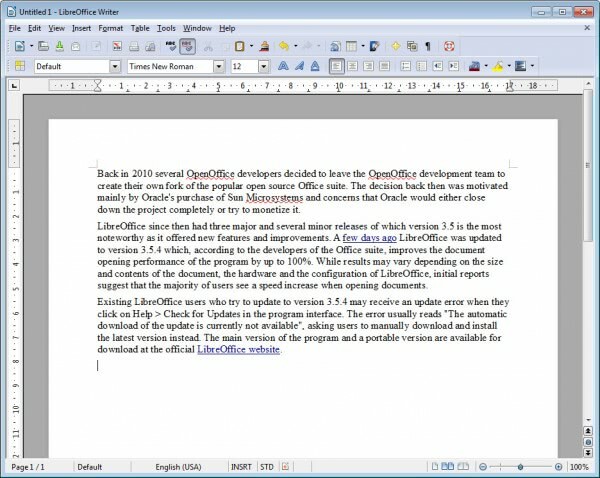 Back in 2010 several OpenOffice developers decided to leave the OpenOffice development team to create their own fork of the popular open source Office suite. The decision back then was motivated mainly by Oracle's purchase of Sun Microsystems and concerns that Oracle would either close down the project completely or try to monetize it. LibreOffice since then had three major and several minor releases of which version 3.5 is the most noteworthy as it offered new features and improvements. A few days ago LibreOffice was updated to version 3.5.4 which, according to the developers of the Office suite, improves the document opening performance of the program by up to 100%. While results may vary depending on the size and contents of the document, the hardware and the configuration of LibreOffice, initial reports suggest that the majority of users see a speed increase when opening documents. Additional performance improvements and bug fixes have found their way into the update which improve the program's speed and stability further. Existing LibreOffice users who try to update to version 3.5.4 may receive an update error when they click on Help > Check for Updates in the program interface. The error usually reads "The automatic download of the update is currently not available", asking users to manually download and install the latest version instead. The main version of the program and a portable version are available for download at the official LibreOffice website. It is interesting to note that there seems to be a rift between OpenOffice and LibreOffice, and the operating systems the programs are most popular on. OpenOffice for instance appears to be favored by Windows users, while Linux users predominantly seem to favor LibreOffice. Comparing download statistics on the other hand may not be the best option to compare popularity, as Linux users have other options of downloading than to download applications from their project websites. Which leads to the closing question: are you favoring LibreOffice or OpenOffice, or using a completely different program for all your document editing, viewing and management needs? I favor LibreOffice because it has had 6-12 months extra development, improvement and fixes compared to Apache Open Office which was only resurrected recently. However, the first one that totally removes any possible need to have Java installed would also get my vote – it pains me to have install Java (with all its security risks) on users’ systems just to fully use one of these Office suites. The sooner they remove all dependencies the better. I recently installed Libre Office on my Win7 and on my WindowsXP systems. Evidently that was just before the update, because I was a little disappointed with how long it takes to open a document. I’ll try updating. I tried OO years ago and just didn’t like it. I got interested in Libre when I began to read that it was less bloated. Well, I dunno. There are other office suites out there – yes, they cost $ – but they are consistently available for greatly reduced prices and they are better and truly less bloated than either OO or Libre Office. SoftMaker, for instance. I’ll leave Libre Office on my Win7 computer since I seldom use it, but if upgrading doesn’t improve the startup speed on my XP computer, it’s going. I’ve got a better office suite to use that opens in a flash. LibreOffice. Nothing against OO, but it appeared to be stuck on the rocks there for a while, so I jumped to the ship that was still sailing. I use LO in both Windows and Linux environments. Try uninstall it and see if you can live without it. I was an OO enthusiast several years back. But many of the wizards did not work, there were formatting problems that I found “religious” resistance to fixing, and the macro language and editor was useless to me. After a year of fighting the tide I returned to MS, and immediately began to enjoy a tripling of production. LO would have to have cleared these hurdles for me to embrace it again. LibreOffice (LO) is great. Its improving so much & so fast. Its like watching a baby grow up. It should have a download counter to see the numbers grow. But this won’t count all the millions of people (like me) who do not have to download LO as it comes built-in with several popular Linux OSs (for example Ubuntu/Kubuntu). Even LO upgrades on Linux distros are easier, as they come in convenient updates of the OS that can run unobtrusively in the background. I use LO as a backup to my main office suite, Softmaker. Apache OOo has potential, unfortunately the Apache license is incompatible with the GPL used in LO. I need one functionality, changed in LO, but preserved in OO: contents table in Navigator is unfolded by default in OO and folded by default in LO, you have to unfold it chapter by chapter, there was no “unfold all” button. For documents I work with, which can have dozens of chapters, I need contents table fully unfolded, so I got stuck with OO 3.3, and OO 3.4 now. But performance boost sounds intriguing for me, so I’m going to try last LO release. If something go wrong, it’s easy to go back to OO, not a big deal. Tried LO 3.5.4, and my findings are bad: while there was really some performance boost on .doc and .odt files, there are also huge performance loss in opening my .rtf files – up to 6 times longer than in OO 3.4 . I’m very disappointed. It’s totally unacceptable for me, so I’m uninstalling LO 3.5.4. If somebody want to test my results – write a comment, and I’ll share files in question. Also, there were some graphics issues in opened .rtf files. I was a longtime user of OOo and then LibreOffice, but it always come down to one crucial issue – they were just so darn slow. I have found when using the same hardware, MS Office 2007 and now 2010 are lightning fast in comparison. It’s great if they are making inroads in performance improvements, and I’ll have to try the new version to see how big an impact it really feels like, but it’s hard to compete with the fact that Office 2010 opens any document I ask of it in an instant. OOo and Libre have always taken an extraordinary amount of time to get started. The updated LibreOffice is running obviously faster on my PC. I have a 4 core processor, and I wonder if they are they exploiting multicore hardware? I’m a bit of a power user (I use the keyboard). and have had enough trouble adjusting to the weird complications of Office 2007. I was led to believe that OpenOffice was more like the older versions of MSO. I have not found that to be the case. I’ve been using Excel since about 1992 and before that I had SynCalc on my 8-bit Atari. When I think about speed, I think about how fast I can work, once I have a file open. I have difficulty navigating across several worksheets in OO. And the search and replace and delete functions are odd. I plan to try LibreOffice, but it isn’t available in my basic Mint repository, so it may take some work. Hope the F5 key works. I also plan to try MSO 2010 (with Wine), since it is so cheap through my company. Also a bit of work, and I hope it doesn’t crash my system. Since most biggies use MSO, we would need at least to open up what others send us even if we have OO or LO. MSO people seem to really ensure that such files do not open properly in any other platform. Used OO and LO, to use it as such it is good if we do not need to open someone’s MSO or we went to send someone MSO. Yes good choice if people to use legit software. One thing someone really needs to tell this Libre Office team is they really need to change this lousy tongue twisting name ‘Libre’ to something more easier or catchy. Why not have free office ? More people will come to know it is free!